Wednesdays have become my writing days. 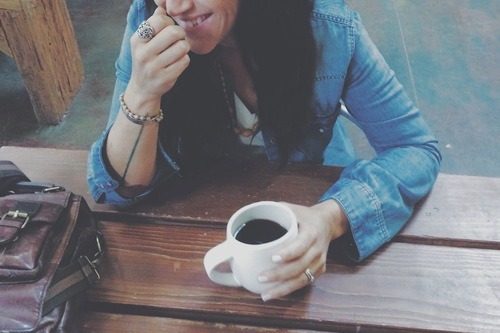 I drop off the kids at school, find a spot at my favorite coffee shop, grab a pour over and get cozy. Last week I was writing about my adventures as a traveling worship leader, when the cutest teenage couple came in and sat within ear shot of me. Now, to be clear, I wasn’t eavesdropping, but as I saw them get all comfy on the couch next to one another, I couldn’t help but notice (and hear) them. You recognize young love when you see it. It’s all about body language. She flips her hair, and tilts her head just so. He chivalrously offers to go get her a glass of water instead of letting her get it herself. Every comment is met with more laughter than necessary, and there’s very little silence. Everyone else around them disappeared as they got lost in their own little world. It was adorable to watch as I remembered the days when I flirted with my (soon to be) husband when he was still oblivious to my real feelings about him. As they continued to chit chat, I began to realize they were talking about mission trips, and all that God was doing. I was all smiles inside as I got excited about what God was going to do in these two young people. I thought back to when I was their age and I was excited about going on a mission trip to Africa, it was all I could talk about. As I reminisced, suddenly God started talking crazy to me. “I want you to pray for them” said His voice running through my head. I’m sure I outwardly showed my confusion as I thought, “I don’t even know them, I just thought they were cute! I mean, aren’t they cute? What am I supposed to pray for them about, and besides I’m writing right now, and I don’t have much time”. I continued on with my work, as that thought (read command) kept running through my mind. Finally God said it strongly one more time “Go pray for them.” My heart started pounding, and my lips got chapped just thinking about it. You see, most people who know me are aware that I’m really more of an introvert. Yes, all areas of ministry God has placed me in are no place for someone who’s not naturally outgoing. But because He likes to show us what a miracle worker He is, and also because I believe He has a wonderful sense of humor, here I am doing a extrovert’s job. It’s quite hilarious when I stop and think about it. And now, here God was again, asking me to step outside my comfort zone! I fiddled with my rings, and gently bit my (now chapped) lip trying to plan out how I was going to approach these cute little strangers. Then raising one eyebrow I realized that whenever I plan something out it never works, so I just scooted across the couch and said “I’m sorry to interrupt, but…um what are your names….what church do you go to?” They looked a little stunned, and a tad wary as if I was about to sell them a Tupperware set. I told them I couldn’t help overhearing them talking about God and just felt like I was supposed to pray for them. Their expression changed as they said “Ah that would be rad! Yeah, totally!” So we bowed our heads and I just prayed that God would bless them in whatever He was calling them to, that they would go forward in boldness. I prayed that they wouldn’t have any wasted years but that their days would be lived out loving and serving Jesus. When i finished praying, they thanked me, and I told them God bless, and nice to meet you. There was no big fanfare. The sky didn’t open up, and I didn’t get some revelation in my head of what they were going through. I did however walk away with an excitement about what God’s next covert operation would be for me! It was downright exhilarating to see how God gave me a command, and then gave me the bravery to carry it out. Sometimes God calls us to do things that seem small, almost insignificant. But honestly, is anything we do for Jesus meaningless? I may never know why those two needed a prayer that day, and that’s ok. All that matters is that I did what God wanted me to. What about you? Any strangers God wants you to talk to today? I double dog dare you.